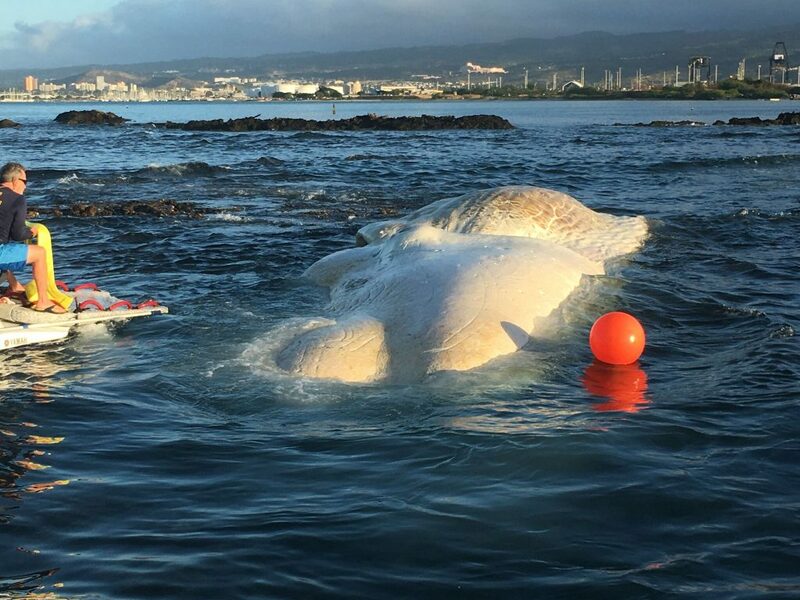 Whale Carcass Tow 1-19-19 from Hawaii DLNR on Vimeo. The sperm whale carcass on a remote West O‘ahu beach is giving a variety of science and cultural researchers the chance not only to try and determine what killed it, but to also expand on our understanding of this species’ behavior, what they eat, how marine debris may or may not be impacting them, and how carcasses degrade in place as part of a natural ecosystem. 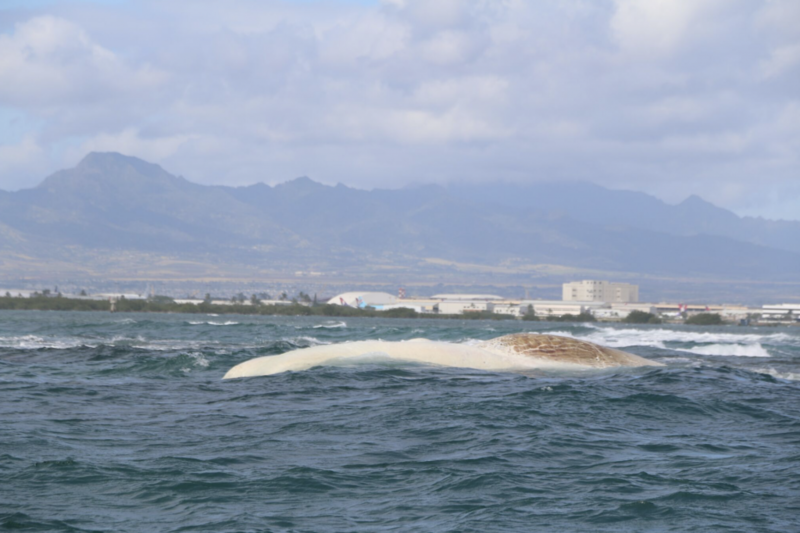 The whale’s carcass has been present in the water around O‘ahu since at least Jan. 10, 2019, when it was first spotted outside Kewalo Basin. It then ended up on a rock outcropping perpendicular to Sand Island State Recreation Area. On Saturday, Jan.12, the carcass was towed approximately 15-miles out into the open ocean. During the next week, currents brought it back toward land. A second towing attempt on Jan. 17, was not possible due to rough and unsafe sea conditions. A third, successful attempt on Jan. 19, got the carcass about two and a half miles offshore but went no further as the boat towing it was taking on water. Currents again brought it onto land and onto the beach where it currently rests. 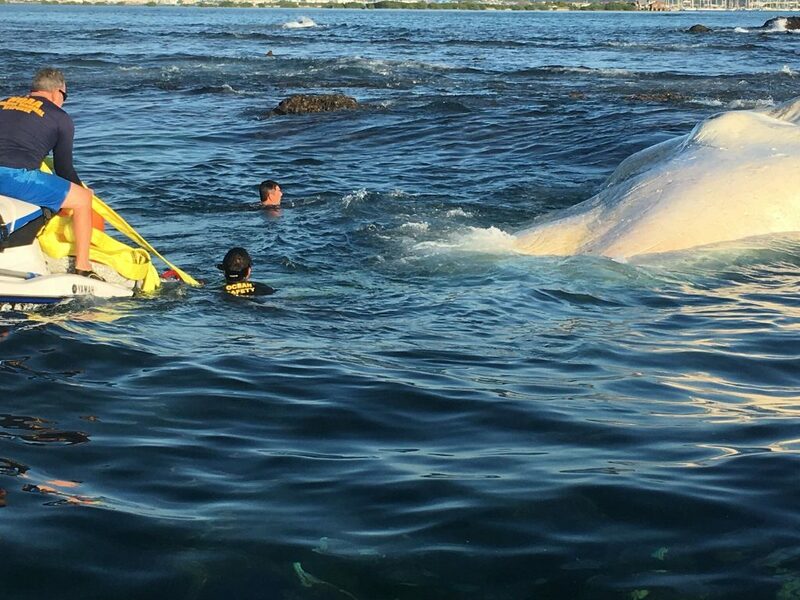 All the tow operations were conducted by the DLNR Division of Conservation and Resources Enforcement (DOCARE) with expert consultation from the DLNR Division of Aquatic Resources (DAR) and NOAA’s Marine Mammal Response Team. The City and County of Honolulu Ocean Safety and Lifeguard Services Division provided manpower and jet skis to assist with the tows. 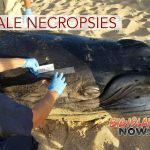 Dr. Kristi West, who heads the Hawai‘i Institute of Marine Biology’s Marine Mammal Stranding Lab, says a necropsy on the whale last week showed no evidence that the animal had ingested marine debris like plastics, so that was not an apparent cause of death. Scientists will continue to look at bones as the carcass decomposes and this could help them rule out causes of death such as blunt-force trauma, bone breaks or disease. They were able to collect some teeth, though many teeth and the lower jaw had been removed with a chain saw. 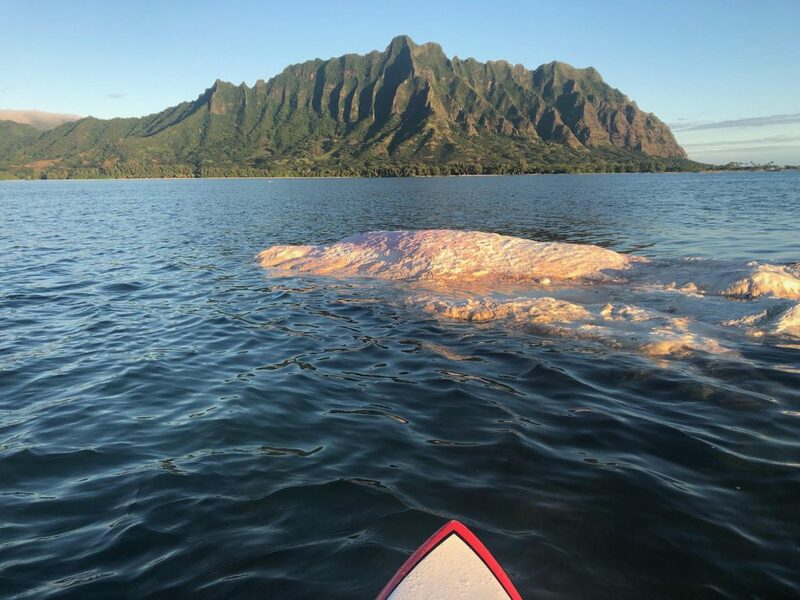 Dr. Noelani Puniwai, an Assistant Professor of Hawaiian Studies at the University of Hawai‘i Mānoa, is leading a team of students looking at how the carcass is degrading in place as part of the natural ecosystem. 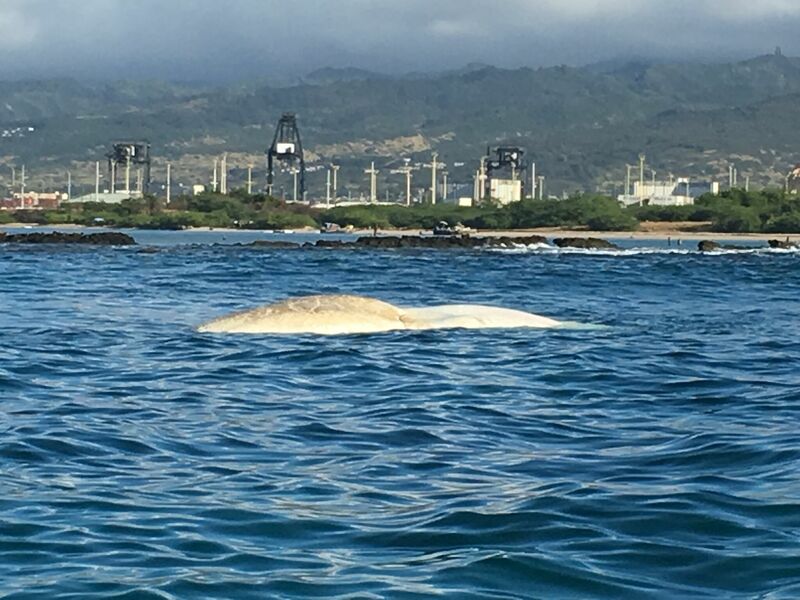 “From a cultural stand-point we always look at the whale’s best interest, as they not only represent a large marine mammal, but in Hawaiian culture they represent our kupuna who traveled from far, distant places,” said Puniwai. “They are amazing messengers, as we can learn so much from them and help us to determine our own roles in the environment.” Puniwai reminds people that everyone should respect whales—dead or alive—as they are both culturally and scientifically significant, thus the reason for the slate of federal and state laws that protect them. 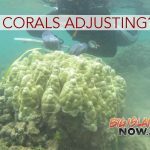 STUDY: Are Hawaiian Corals Adjusting to Warmer Temperatures?